EIGHT villagers at Sand Field 1 and 2, popularly known as Warri Corner, Warri South-West Local Government Area, Delta State, were hit by stray bullets when men of the Nigeria Navy, NNS Base, Warri, Delta State, shot sporadically into the air while allegedly testing their weapons on Thursday. 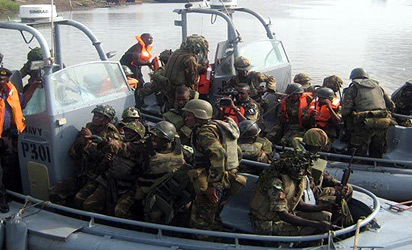 The Foundation for Human Rights and Anti-Corruption Crusade, FHRACC, in a statement, yesterday, described the random shootings as irresponsible In a related development, the Niger Delta Peace Movement, NDPM, has raised the alarm that mother and two children were missing , while six persons were seriously injured in an aerial bombardment of a fishing settlement in Burutu by troops of Operation Delta Safe, earlier same day. National president of FHRAAC, Alaowei Cleric, said in Warri: “About eight persons hit by stray bullets have been hospitalised in different health centres across Delta State. “This is highly ridiculous as the Navy seems to be telling the world that it does not know the difference between testing weapon and attacking enemies. How on earth can testing the military weaponry result to sacking an entire community, which has inflicted grievous injuries on the innocent and peace-loving settlers in the Island? “This is a manifestation of the Federal Government’s agenda to wipe out the Niger Delta communities from planet earth ostensibly to allow it have free access to the oil. We hope that the world is seeing these systematic invasions of Niger Delta communities whose offence is that they have oil in their lands,” it said. The group asserted: “We can safely say that a silent genocide is going on in the Niger Delta. For the military to absolve itself of any culpability, let it set up an independent panel of inquiry to ascertain the truth. Let those unprofessional and trigger-happy military men be brought to book.” On the bombardments of Okosugbene settlement in Burutu area by the men of Operation Delta Safe, the group said: “The military ought to have adhered to the rule of engagement. Its operation has hospitalised more than three persons, who are innocent fisher men and women.” “From our findings, Okosugbene is known to be a fishing camp which has been in existence from time immemorial. If there is any militant camp close to the village, the military ought to have separated the militants camp from the village. The casualties of the military bombardments of the village are women and their children. “We have reliably gathered that Master Wisdom Ekeremo, 5 years and Miss Paulina Maika were hit by the bullets of the invading military, while Mrs Apunu Akaraowei is missing. The entire fishing village has been brought to rubble by the aerial bombardments. We have not heard of any militant casualty, which ought to have been the target of the military, the group asserted.